What if you lived in the paradigm where you believe that you chose and created every single life experience you are having now? Including catching a cold, losing your luggage, not getting that apartment you liked, missing a car-spot and at the same time all the good “fortune” and “lucky-breaks” that befall you? What if they didn’t “happen” to you, but you attracted them knowingly or perhaps subconsciously? What if we lived in the awareness that we really can choose how we respond to life? That life is not a sum total of all the automatic reactions where we “had no choice”? Since Daniel Goleman coined the term “The Amygdala Hijack” to describe emotional responses from people which are immediate and overwhelming, and out of measure with the actual stimulus because it has triggered a much more significant emotional threat, usually embedded in our limbic brains in our childhoods, we’ve heard a fair bit about these 2 almond-shaped glands that reside in our limbic system and their relationship to our automatic reactions. According to one of my most respected authors, Dr. Joe Dispenza, “in a research from the HeartMath Institute, they pointed out that there are afferent nerve fibers that go directly from the heart to not just the brain, but they go directly to the amygdala. Why is this important? Because the research demonstrates that when you open your heart and feel love — really surrendering fully to love—the power of that profound love can create a new baseline in your brain and body’s survival systems. This means that the heart, in fact, is also a command center of the body, as well as the brain. When we truly open our hearts, let go of the past, and forgive, we reset our baseline into a more harmonious, more elevated state. 1. Pause, take a long deep breath, then another. I first learnt about the Amygdala when doing a Yoga Teacher’s Training Course, we were taught that breathing is the ONLY function of the ANS (Autonomic Nervous System) that our Neocortex (thinking mind) can try to affect or control and at the same time control how we feel to an extent. By “controlling” our breath we can actually affect how we feel. Under stress, respiration becomes rapid, shallow and isolated in the upper chest. Shallow or rapid breathing reaffirms to the ANS that the body is in danger, leading to SNS (Sympathetic Nervous System) activation (fight, flight or freeze). Conversely, slow, deep, diaphragmatic breath tells the ANS that the system is safe to relax and repair, leading to PNS (Parasympathetic Nervous System) activation (rest and digest). We can elicit parasympathetic nervous system (PNS) activation by deepening and slowing down the breath. 3. Visualize what you want to experience rather than imagining all the catastrophic things that could happen – as “worrying is praying for what you don’t want” By vizualising the desired outcome, and declaring the intention, you give “it” a higher probability of coming to be. If you want to learn more about the power of vizualization look up the works of Mike Dooley. 4. The only difference between Mastering your life and being a Victim lies here in exercising your CHOICE to respond rather than to react. Responsibility implies the ability to respond – carefully, mindfully – what response will bring me closer to living my purpose, will this help me have the kind of relationship I so wish to have, will this response help me towards what I say I so desire, rather than to have a “knee-jerk” automatic reaction which will only keep me spiralling downwards into the very rut I so want to get out of. The proverbial viscious cycle? 5. Meditate twice a day – it will re-connect you with that Creative, intuitive and wise part of you and it increases that space between stimulus and response giving you more chances to choose how you respond to your various life situations. The last few days of the year, the festivity, carols, lights and spirit of celebration always makes me a little reflective, hope you enjoyed this post and please share your experiences on reacting vs. responding. What does the body have to do with personal power? We humans live in language, the results we have in our personal and professional lives depend on the conversations we have in our relationships. We respond through our emotions, which are set in a background of moods, that is born in the body. is not enough, if it were, we would all be living fulfilled and purposeful lives in this time where thousands of self-help books abound us. bodies and the only way to transform really, is through repeated PRACTICE. We say “embodying” because it is about truly feeling our bodies from the inside. Wriggle your toes now and you will realise that you were not consciously aware of the surface your feet are on or the temperature around them, but now you are. When we deliberately become fully present and aware of our bodies from the inside, and realise that our thoughts and feelings are running through our veins, bloodstream and fibers, we start to tune in to the present and in this state, we are most powerful. Our breathing is one of the functions of the Autonomic Nervous System (ANS or involuntary nervous system). It is the part of the peripheral nervous system that functions largely below the level of consciousness and controls many of our functions including heart rate, digestion, respiratory rate, salivation, perspiration, pupillary dilation and sexual arousal. Plugging in this way is like putting the gear in neutral. From here, you can choose where to go next in your body, emotion and language. Think of our earth and the axis that it rotates around, it cannot coexist in this universe if it weren’t rotating around its own axis. When we are not plugged in, we can become easily affected by the people around us but when we are grounded and centered this way, we can in fact hold a creative and safe space for others. The centre of your body is 2 inches below your navel; imagine a space right in the middle of you, halfway between front and back, left and right and top and toe. Breathe into this space. Accept things as they are, all your thoughts, your emotions, your feelings, put everything else aside. They are already in the past. Accept them, don’t change or resist, just accept your emotions. Acceptance is the centre of emotion. Listen to the sounds and identify them, then imagine there’s silence around you. Silence is the centre of language. All you have to do now is notice your breathing. Notice also if your thoughts are causing your emotions, or is it the other way around. Feel the emotion in your body, whatever it is, do not judge it, just breathe and accept it. Acceptance also helps to alleviate pain. Open your eyes. You are plugged-in. You are now in neutral, from here, your choices increase. You can go anywhere from here with grace and ease. Practise this often and do it anywhere, you can practise plugging in seated of standing up too, before you go from one meeting to the next, from work to home, from one call to another. Whenever you feel overwhelmed or flustered, confused or annoyed, overtly excited or concerned, you are plugged out, take two minutes and come back. The following is an excerpt from Robert Oates’ book Celebrating the Dawn, which was first published in 1976 by G.P. Putnam’s Sons, New York. Q: What’s the goal of Transcendental Meditation? Q: But activity and quietness seem to be opposites. Isn’t it necessary to sit and close the eyes in order to enjoy the peaceful effects of the TM technique? Maharishi: “It’s only in the beginning days of meditation that one has to meditate in order to experience that silent, quiet level of the mind, that state of pure consciousness. As we continue to alternate the experience of the meditation with daily activity, the value of that pure consciousness is infused into the mind. The pure level of consciousness becomes stabilized in our awareness, and when that pure level – the state of least excitation – is a living reality even during daily activity, this is the state of enlightenment. This is life free from suffering, life when every thought and action is spontaneously correct. Q: But how is it possible for the mind to experience two different states at the same time? Q: Then it would be necessary to dissolve stress in order to experience the state of enlightenment. Maharishi: “Yes. And it brings very practical value to life. Even if we forget about ‘enlightenment’ for a moment – maybe that state seems to be inconceivable – still it is our daily experience that the whole value of life is very little if we are tired, if we are stressed. If we think of a morning when we have not rested well in the night, then we feel so groggy and everything just collapses into dullness and inertia. The world is the same as on the other days, but our appreciation of the world is so much less. And with the Transcendental Meditation Technique we have a natural and effective means to dissolve even deeply rooted fatigue and stress. This is the way to unfold full value of life. Even in the first days of meditation we find that our eyes seem to be a little more open, our mind seems a bit more clear. Our feeling towards our friends seems to be more harmonious. And then, as the practice is continues every day, a time will come when we will start living life free from all stresses. We cleanse the awareness of all stresses and strains, leaving the conscious mind completely free in its pure value. Q: Does this mean that evolution toward enlightenment is automatic as stresses are released? Q: Maintaining contact with a bank – can that analogy be made clearer? From Celebrating the Dawn by Robert Oates Jr.
Sweet 2016 is almost over…how was it for you? What are three words to describe the theme of 2016 for you? What did you spend most of your time doing at work and outside of work? What key values did you notice yourself living more fully this year? What disappointment turned out to be the biggest blessing for you this year? When did you experience compassion, both giving it and receiving it? What did you buy for yourself that turned out to be the best thing ever? What did you give/give away that brought joy to someone else? As we come to the end of another year, find a few minutes for yourself to look back and appreciate the gift of life. As we still have a few days left, take one step to truly make 2016 memorable, let it go down in your very own biography as the year you… ??? What do you deserve a huge pat on the back for? I’d like to thank all of you for your continuous support of my writing and my work. We were all born to be the best of who we are and were meant to be in this world to shine to the highest of our abilities. However, as we go through each stage in life, we are limited by our beliefs that may have come from our parents, our education, our society, and even from our previous life experiences. It is these “filters” that inevitably limit us from becoming who we were meant to be. As young children, we are often subjected to harsh and negative words. These comments, though sometimes unwittingly said, often bring up a sense of inadequacy, the thought of “I will never be good enough”. Similarly, we are often unappreciated for the good deeds that we have done; and instead are constantly reminded of our “wrong/bad” actions or failures , be it from our parents, our teachers, or our mentors; which ultimately leaves us with the “I will never be good enough” feeling. It is all these feelings and emotions that undermine our confidence, our esteem and our self-worth. If you’ve read my books, then you already know that I was a fat kid, and so as I was growing up, my self-esteem was plummeting with each aspect of puberty kicking in. My parents were wealthy and we lived in prestigious condominiums around Orchard Road in Singapore, so survival wasn’t on my radar back then, but as my dad went through his upsets as a businessman in Lucky Plaza, together with being an obese young woman, I also had to deal with depression of not gaining the affections of my first teenage crush to having to let go of my “Uptown-girl” status and adjust to a new life in a new country amongst people I didn’t fit in with. Looking at the Values chart, and Maslow’s hierarchy of needs, you will see that my level, 1, 2 and 3 needs were being challenged all the way. Then came the clincher when I was 26, still over-weight and divorced with a young daughter. From survival, to belonging to self-esteem, my un-met needs kept me in a web of despair. But then, luckily for me, I have truly been blessed with an inner drive to not just survive but also an inner knowing that I had a purpose and was going to live it. Struggling just to get my needs met was not enough to keep me busy. You see, I was living in a space of victimhood where I blamed everyone and everything around me for what was not working in my life. I look back at that time now with gratitude for the invitations that came to me to explore myself deeply. I was blessed to be open to re-discovering myself and asking different questions instead of “why me?” I was introduced for the first time to asking, “what can I do with what I now know and what I now have?” Looking at the chart again, this was the stage of transformation – and in Barrett’s terms, Level 4. This question always helped me to find a lesson and a way forward breaking through my fear barriers and venturing outside my comfort zone. As part of my personal evolution and my work, I am developing the habit of remembering to frame my life experiences into modules that we share so that I can breathe life into them. Since I started using the iceberg model more frequently, I can’t help but be aware of not only my own iceberg but I also see people walking around with their icebergs, then when my over-active imagination starts to work, I see our icebergs touching and then I get this feeling of “rubbing each other the wrong way”. I’ve also been “ice-berging” taxi drivers when they make the “mistake” of asking me what I do on a day when I’m not busy with my phone. Many of my friends have experienced me drawing icebergs on paper napkins too. Yes, I have become obsessed by the iceberg. 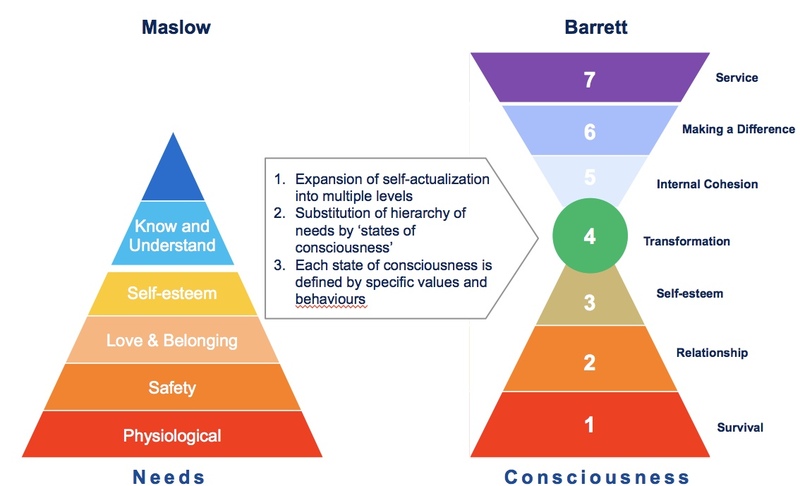 The good news is that it has helped to reconnect me more fully with my values of empathy and compassion which according to Barrett belong to Level 6 and 7 consciousness. I have become more sensitive to what drives the behaviours in the people around me and yes of-course, when I have my introspective balcony camera on, or as we say in Newfield Asia, when I look a the Observer that I am, I am able to see my own behaviours from a higher balcony and am compassionate towards myself for acting the way I do. We are all walking around with our thoughts and feelings, values and priorities, our beliefs and mindset that lead us to act in the way we do. This awareness has helped me to acknowledge that people especially the ones who are behaving in ways that trigger irritation, anger or annoyance in me are merely just trying to get their perceived unmet needs met. A mother trying to protect her child, a father just trying to put food on the table, a husband needing to show his wife he can be leaned on or a business owner just trying to make a profit. Without meaning to sprinkle quotes that most of us already get enough of through our Facebook feeds, one quote that I happened upon just outside an airport in India comes to mind strongly right now, “Be kind, everyone you meet is carrying his own heavy load”. As I read this, happily strolling my four-wheeled luggage, waiting for my car to drive up, I became intensely aware of elderly couples with heavy sacks bogging them down on the streets stricken with poverty and those who had a permanent hunch as if there were a ton of bricks still literally on their shoulders. It’s only when I reconnect with my higher values of wanting to make a difference, of courage and of compassion that I’m able to feel that empathy and forgiveness (level 7) for others and for myself and respond to situations and people from a much more empowered, loving and joyful way. By judging myself and others I remain stuck in a loop and when I choose to be trusting and fair, I release myself from that loop and am able to evolve consciously. I am not saying that I don’t get triggered, and like anything it is still a muscle that I am building by being aware, by moving to the balcony and introspecting on how I could be causing or why I may be attracting these upsets into my life. I am immensely grateful for being introduced to the Values framework as it continues to guide me to evolve my consciounsess towards humility-(Level 7). Each and every set back I’ve had truly urged me to live my values more fully and stay focused on my purpose, even when I could not entirely articulate what that purpose was, it remains the light that beckons each one of us to keep at it, to keep moving on. Once we accept the past regrets with gratitude, we will have strengthened the belief that it is really all good and that we are supported in being able to live that purpose, it is an internal guiding GPS that will always keep us headed in the direction of inner fulfillment.